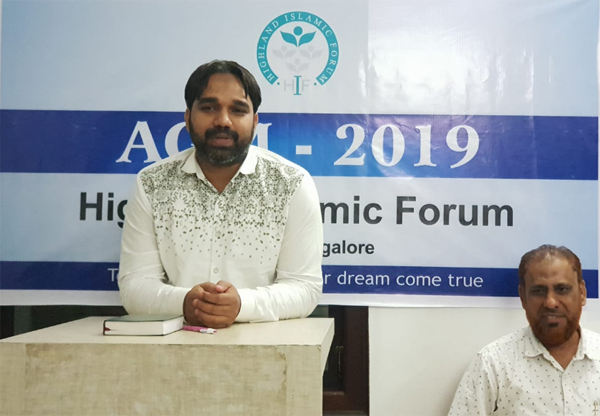 Mangaluru, Feb 9: Businessman Sajid A K, was unanimously elected the president of city-based Highland Islamic Forum on Saturday, Feb 9, during its annual general body meeting (AGM) held at HIF Head office, Mangaluru. The AGM was started with Quran recitation by brother Mehfuz. The programme was chaired by the outgoing President Nazim SS and the Election Commissioner Mr Arif Padubidri. Outgoing President Nazim SS welcomed the gathering and presented a brief report about H.I.F and all its activities from its inception. He also thanked the executive committee and all members of the H.I.F for their tremendous support throughout his tenure requested the gathering to extend the same support to the new president and the committee. Soon after the welcome note, Mr Arif Padubidri spoke a few words on his thoughts on H.I.F and his connection with the organisation. He also shed some light on choosing the right leader and its impact on an organisation. The newly elected president Sajid Ak, showed his gratitude to the Allah for giving him an opportunity to lead the H.I.F team and promised to be available with the members at any given time. He vowed to give his fullest for the betterment of the organisation. Ausaf Hussain was announced the Secretary of H.I.F. Mohammed Rizwan was elected treasurer.